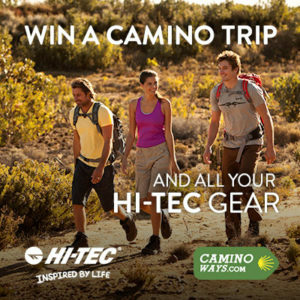 To get you started on your Camino adventure, Hi-Tec have teamed up with top Camino de Santiago specialists CaminoWays.com to offer you the chance to win an unforgettable 7-day Camino de Santiago trip for two people; as well as a full Hi-Tec Camino gear kit. We also have fantastic runner up prizes of 20 pairs of Altitude Lite boots worth £60 each! The Camino de Santiago is an ancient path and unique journey. Pilgrims from all over the world have followed the many paths to Santiago de Compostela and the tomb of St James for centuries. Today, whether walking the Camino for religious or spiritual reasons, to finding yourself or for its natural beauty, the Camino de Santiago is a trip of a lifetime, a unique experience that inspires many, even after their journey is over. Hi-Tec and CaminoWays.com have partnered to give one lucky winner the chance to experience the Camino with a friend this year, walking the last 100kms of the famous Camino Francés (French Way) from Sarria. You will also get kitted out with the best Hi-Tec Camino gear: Altitude Lite waterproof boots the official Camino de Santiago boots, Hi-Tec waterproof jackets, socks and insoles. The Altitude Lite is a versatile walking boot crammed full of innovative technology and designed to be wonderfully lightweight. The Altitude Lite is available for all the family, including women, men, junior and children styles and sizes. Perfect for the heat, the boot features a breathable, waterproof suede and mesh upper and OrthoLite insole with anti-odour and anti-microbial technologies. Whilst the boot is durable and lightweight, it does not sacrifice comfort with a padded tongue and collar and moulded midsole. *THIS COMPETITION IS NOW CLOSED. To see our list of lucky winners click here. Enter for the chance to win this fantastic prize, with 20 people in for the chance to win a pair of Hi-Tec Altitude Lite boots to go on their Camino adventure! Competition open to United Kingdom and Republic of Ireland residents only. Competition is open until 28th February 2015. Winners will be announced by Hi-Tec and CaminoWays.com in early March. Prize is subject to availability and only in sizes 4-13. Should the winner’s size be out of stock, an alternative style may be offered. Holiday prize includes 6-night accommodation on B&B basis, luggage transfers and holiday pack for 2 people from Sarria to Santiago de Compostela. Travel dates subject to availability. Winners must book in 2015 to travel by 1st March 2016. No flights, transport or insurance included. By entering this competition, you agree to register for the CaminoWays.com and Hi-Tec mailing list.